On the day Keller Nunley shot his Connnolly Brothers’ Dairy Farm video it rained. MILFORD – To get better at a craft, do it religiously every day -that’s the idea behind Keller Nunley’s video project. Each day, for a full year that started in February, the 24-year-old film school graduate has been making short videos – each are one to two minutes long – of places he finds interesting. “I am totally enchanted by New Hampshire,” he said in a recent phone interview. His videos feature well-known sites like Fryes’ Measure Mill in Wilton, the Swing Bridge in Milford, Pulpit Rock in Bedford, the “Blood Cemetery” in Hollis and The Homestead in Amherst. More unusual are “Cat Alley” in Manchester, a “forklift graveyard” in Milford, and a grave in Washington, where a man’s leg, just a leg, was buried in the 1800s. But that’s only eight. As of Sept. 10, Nunley had made more than 200 videos. “The product has to be born and die in one day,” he says, which means he has to film, edit and upload it before he turns in for the night. Working with a limited budget, he can’t go far geographically, and Laconia has been the furthest north. He tries to avoid private property, though Day 90 shows exterior and aerial views of a $3.5 million house that’s on the market in Bedford. “Asking permission invites the idea that the individual gets a say over the final video,” he said. The project is fun and challenging, but not easy. And nothing makes a day harder, he says, than filming in a torrential downpour, as he did at the Connolly Brothers Dairy Farm in Temple. 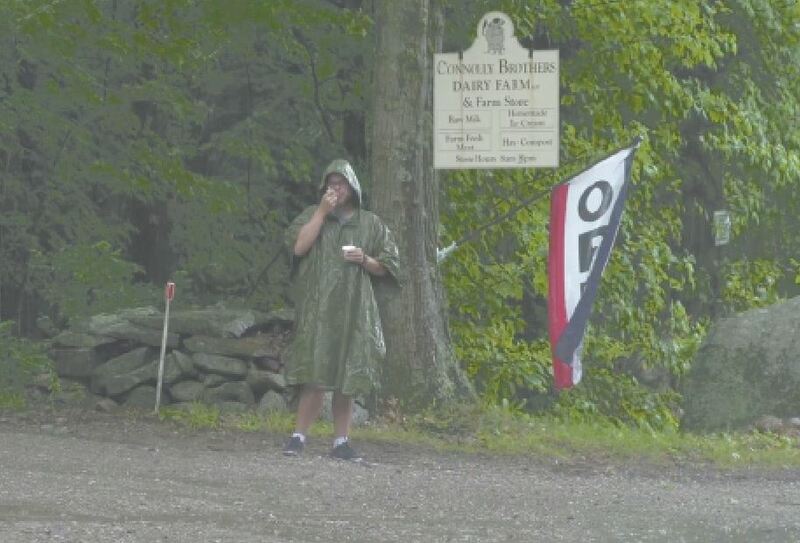 A “dumb shoot” he calls it – him in a poncho eating ice cream in the rain and trying to keep his equipment dry. After graduating from Souhegan High School in 2011, Nunley went to film school in Colorado and worked there producing commercial videas before coming back to New Hampshire. Since Febrary he has only taken a day off when he is able to do two videos in one day to make up for it. Sometimes he quickly chooses a site in the morning; others take much longer. For a long time he’s been trying to find a police department that would let him do a ride-along in a cruiser. What happens in February 2018 when he’s finished? “I might keep it going,” he said, and continue with the commercial videos that he produces on a freelance basis. Most small business don’t realize, he said, how simple and inexpensive it can be to commission a short ad for social media. All Nunley’s videos are available on YouTube, but easier to find on Facebook, where there are a limited number.